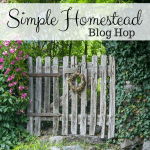 Welcome to the Simple Homestead Blog Hop #182! One of our cohosts, Nancy on the Homefront, is co-hosting a $100 Christmas Cash Giveaway. (https://nancyonthehomefront.com/100-christmas-cash-giveaway/) Feel free to stop by and enter! The Simple Homestead Blog Hop runs from Thursday morning to Sunday evening, so spread the word and spread the love. Share your best material and check out someone else’s best material, too (maybe leave a comment letting them know you found them here at the hop!). Be sure to follow your hosts to let them know you’re here, as well! Personally, I love to use blog hops as a source of pinning material for Pinterest. I find a few posts that I really love and pin away! First, let’s meet our wonderful hosts! Each week our hosts feature their own picks from the previous week, so visit each host’s blog to see if you’ve been featured! If you were featured be sure to pick up your Simple Homestead Blog Hop button below! Just highlight all of the text in the box and paste into your blog post; the button will show up automatically. One last reminder to submit to the holiday giveaway!